Horses are social creatures. They like being around other horses. In many ways, they are very dependent on other horses. In a herd, horses depend on each other to watch and warn of danger. So, when one horse takes off running, the rest of the herd runs too. It goes beyond flight, though. Horses tend to be very attuned to the emotional state of other horses. If one horse acts nervous, other horses are likely to pick up on it and start acting anxious themselves. Likewise, if a horse is unsure about crossing a stream, they will often do better following another horse across. In working with Knockout (my 7-yo gelding) the last couple of years, we have done a lot of solo riding with no other horses around…and we had to work through minor issues with him not wanting to leave the rest of the herd. We’ve ridden with other horses…and we have had to work through minor issues with Knockout taking his cues from the other horses rather than from me. One evening last week, I decided it was time to trim the oak branches hanging low over our driveway. Rather than climbing up and down a step ladder, moving it a foot at a time, I decided to just do it from horseback…using Knockout as a living scaffold of sorts. We’ve done basically the same thing trimming our woods trails, so I didn’t expect any issues. The first tree went pretty much as expected. Knockout let me know it wasn’t his favorite thing to do. But when I insisted he willingly complied. Knockout stood patiently as I reached, clipped, and tugged at branches. He didn’t complain as twigs fell on his head and hung in his mane and bridle. Even when I shook the reins to free a large twig he stood patiently, apparently understanding that’s what was needed. Then we moved to the next tree which happens to be adjacent to our horse pasture. No sooner did we start on the second tree than five of Knockout’s pasture mates ran up to investigate from the other side of the electric fence. Knockout didn’t even look at the other horses, so I just kept trimming as they milled about, reaching for leaves to eat. At that moment, one of the horses on the other side of the electric fence must have touched the hot-wire. They all spun and dashed off in a panicked flurry of hooves. I tightened my grip on the limb in anticipation of being left hanging. But Knockout never moved…never flinched…never twitched a muscle or even acted interested. So I just kept right on clipping branches. I am so proud of this young horse! It is sometimes hard to believe this is the same horse as the green-broke, spooky, flighty, prone-to-bolt young colt I started working with a couple of years ago. In that moment when I was most vulnerable and relying completely on Knockout, Knockout chose to rely on me. He ignored the other horses. He completely disregarded their drama and panic. In that moment, Knockout chose to simply rest in my assuring presence. Isn’t that what Christ calls us to do? When all around, people are swept up in drama and fear…when angry voices cry out for attention…when arrogant voices ridicule and mock…when self-righteous voices condemn…can I calmly trust in Jesus? Can I rest in Christ like Knockout rested in the assurance of my presence? Lord, teach me to abide in you! 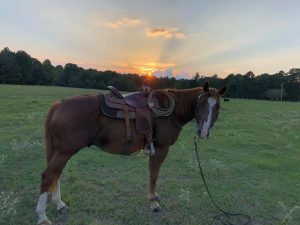 This entry was posted in Animal Stories, Faith, Horses and tagged abide, assurance, faith, herd, horse, horsemanship, horses, rest, trust by joe. Bookmark the permalink.